Roasting a chicken that tastes great all starts by getting your chicken from a quality butchers, like Meat No Veg. Take your chicken out of the fridge and allow it to warm up for at least 30 minutes before cooking. Before you start roasting a chicken pre-heat the oven and make sure it has reached the desired temperature (see our roast chicken cooking time table). Smear a little olive oil over the base of a roasting tray, add some more olive oil on the skin of the chicken and session with salt and pepper. Place the chicken in the roasting tray, breast side up. Plan your time for cooking by using our table on roast chicken cooking times provided. Baste the chicken a few times during cooking using its own juices and the melted garlic and herb butter. Check the chicken is cooked by using a temperature probe (it should be 82C or above) or inserting a flat knife or skewer into the thickest part of the meat, then take it out and press the surface hard with the side of the knife or skewer and watch what colour the juices are that run out. If it is clear then the chicken is done. Take the chicken out of the oven then wrap in foil to keep it warm. Place in a warm spot and allow the meat to rest or relax for 15 minutes before serving. There you have it how to roast a chicken. Simple. Try next time when planning plan your roasting times to ensure your basting times are more frequent and at more regular intervals. 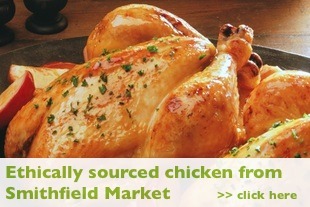 Check your oven temperature and ensure you buy chicken from a quality butchers like Meat No Veg. Take their advice on what is a good chicken. Carving a whole chicken is simple. Wait until the bird has cooled off slightly so that the juices have a chance to be reabsorbed into the meat. Use a knife with a thin, sharp blade and make long, delicate cuts without having to saw at the meat. Use a clean napkin or fork to steady the bird whilst you´re carving. Remove the drumsticks then slice through the thigh meat from the bone. Next, place the knife horizontally at the bottom of the bird´s breast and cut towards the rib cage to loosen the meat. Then cut from the top down alongside the rib cage. Now cut down vertically into the breast to produce thin and appealing medallion slices.